It is worth bearing in mind that the terrain on this route for the most part is featureless and therefore requires competent navigation. 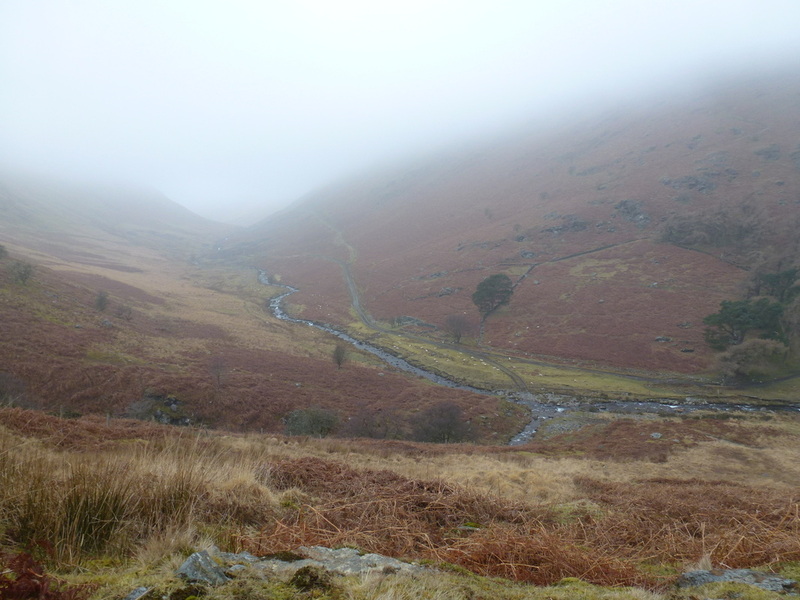 The route should not be attempted in mist unless you are competent in map & compass. Mainly intermittent paths with some boggy sections. 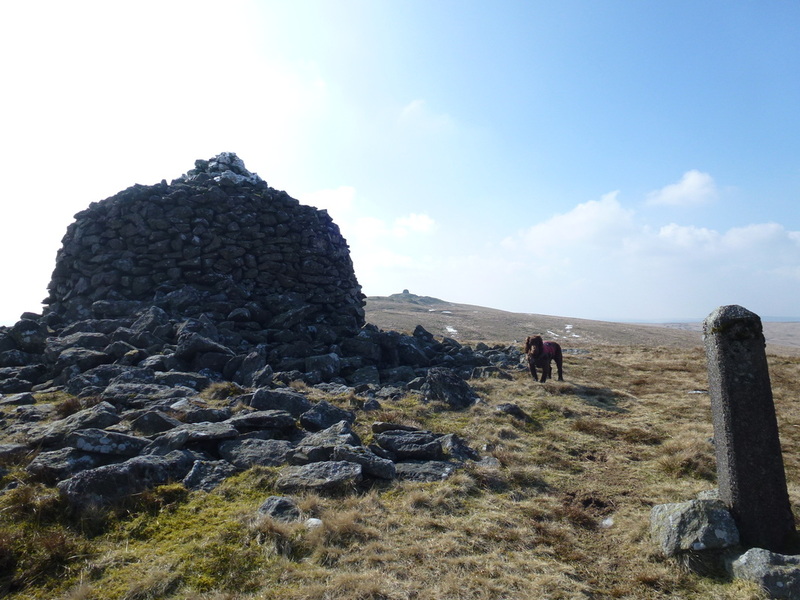 There is a peat bog just before the summit of Gorllwyn but this can be navigated around. 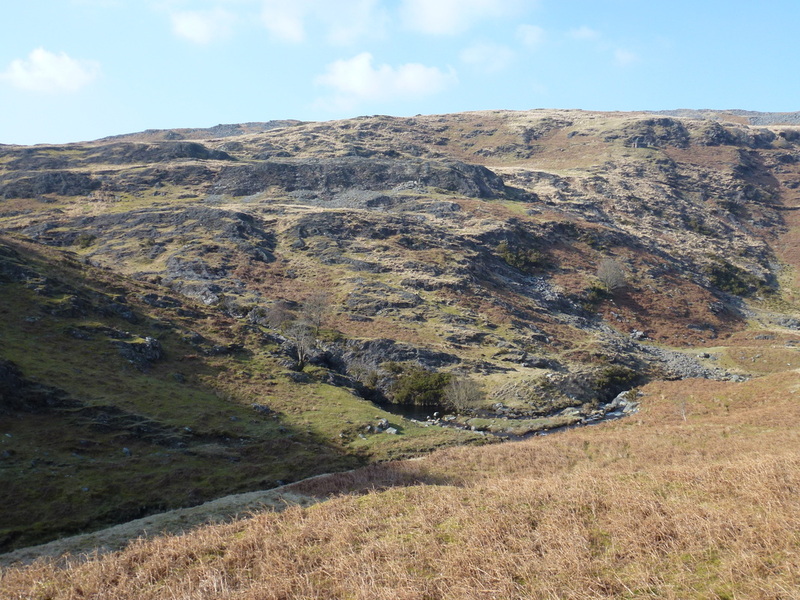 There is no path on the return route from the summit of Drygan Fawr until you reach the Nant Yr Ast stream. 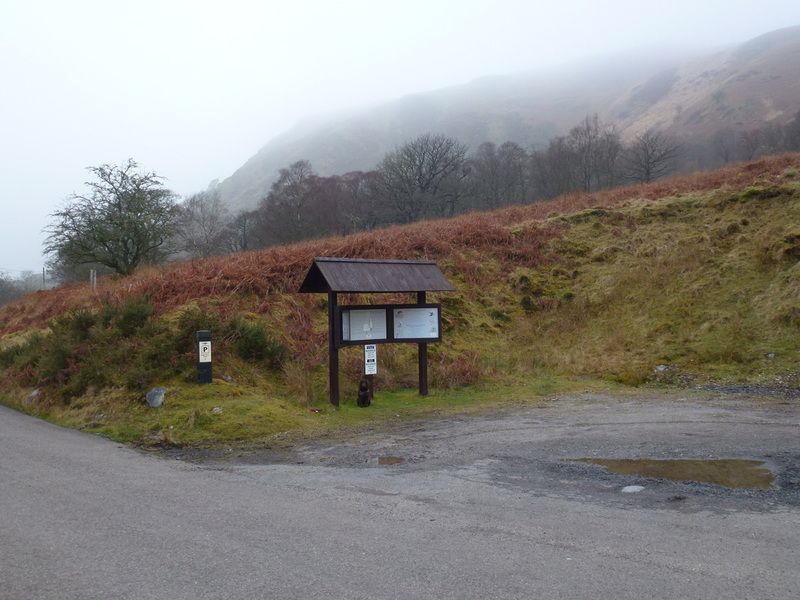 Therefore in bad visibility, to reach the stream it is best to set a bearing on Grid Ref SN872596 and head for this which you should reach if you remain on the bearing. It is then a simple case of crossing the stream and hand railing the river back to the finish. ​Just Fudge and Dave out today therefore as the weather was looking promising I headed over to Elan Valley to bag a couple of Welsh Nuttalls. 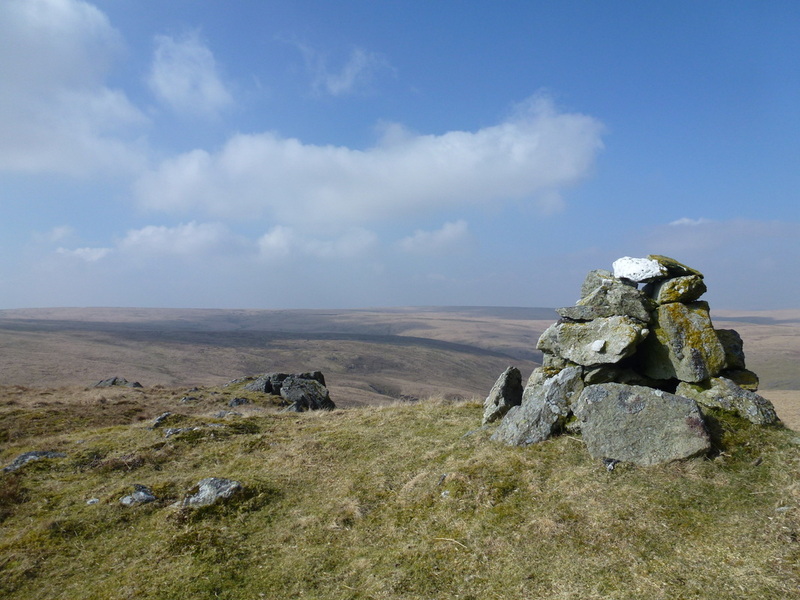 The walk today would visit the summits of Carnau, Gorllwyn, Carreg yr Ast and Drygarn Fawr and started from the Car Park at Llanerch-y-Cawr. I was aware that the terrain on this particular walk could err a bit on the boggy side therefore was all gaitered up! From the Car Park the route headed over the Rhiwnant and climbed steadily on a good track before this petered out and became a grassy path. 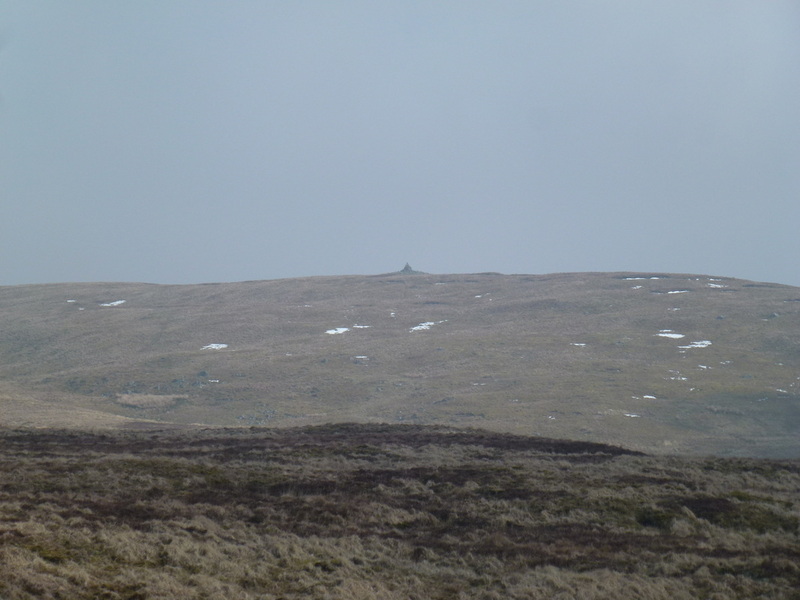 The path continued to rise gently and I soon reached the pass at Bwlch y Ddau Faen. There were paths heading all over the place here and it was at his point I decided to make the quick out and back and visit Carnau and its summit shelter. 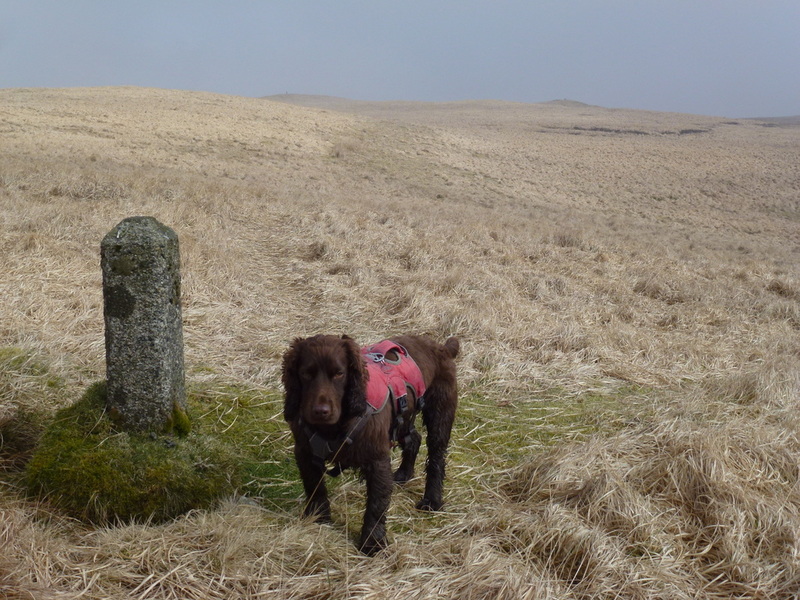 Leaving Carnau, it was back to the pass to begin another out and back - this time out to Gorllwyn where there is a good path following boundary stones all the way although the path over is fairly obvious but does peter out sometimes. 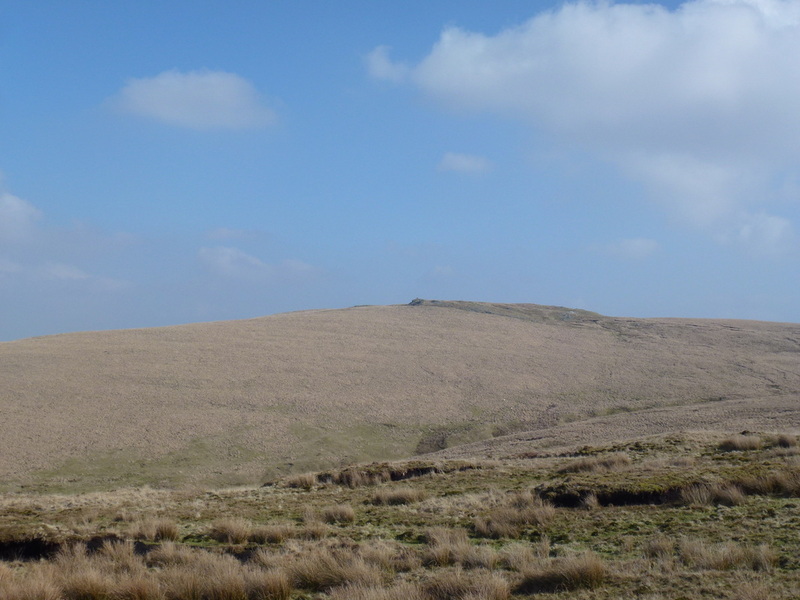 It is worth noting that there is a large peat bog just before Gorllwyn but this is easily negotiated - I bore round to the left on the way to Gorllwyn and to the right on the way back. 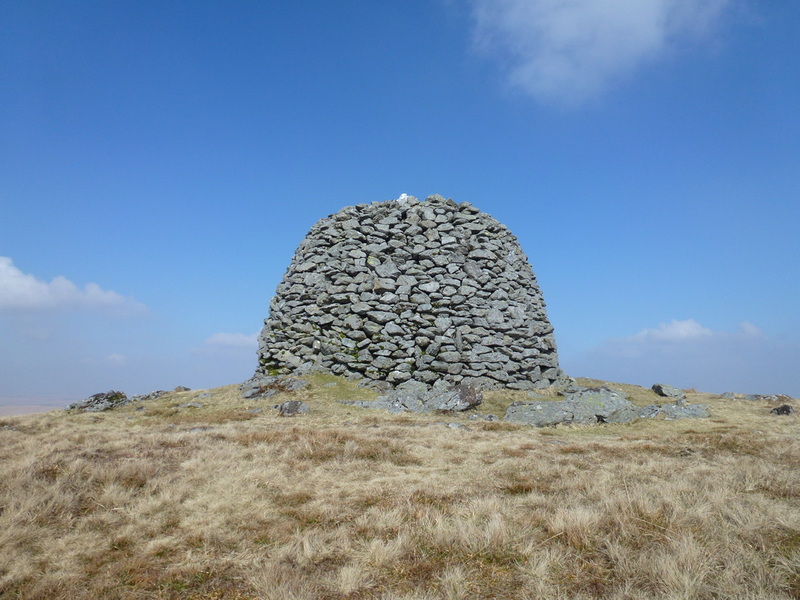 Reaching Gorllwyn, I first visited the large cairn to the south before making my way over to the summit where there is a large shelter that incorporates the Trig Point. 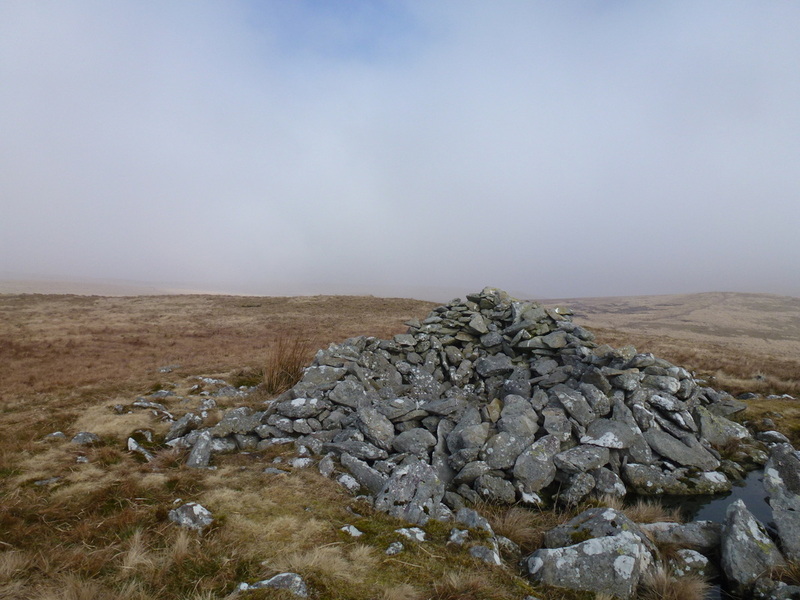 It was now a simple case of walking back, again following the boundary stones all the way to the pass at Bwlch y Ddau Faen. 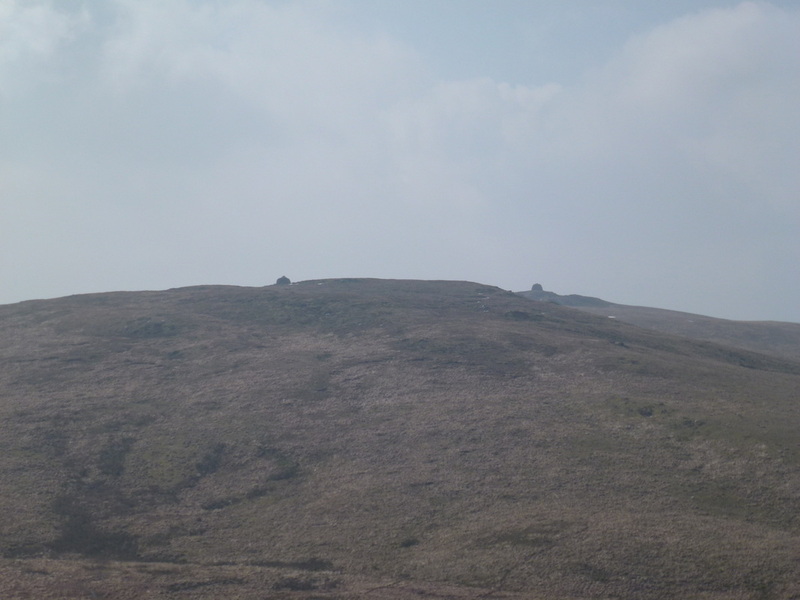 The visibility had now improved greatly and I was able to make out the two giant Cairns on Drygarn Fawr but first I decided to take a quick detour off the path to visit Carreg yr Ast. 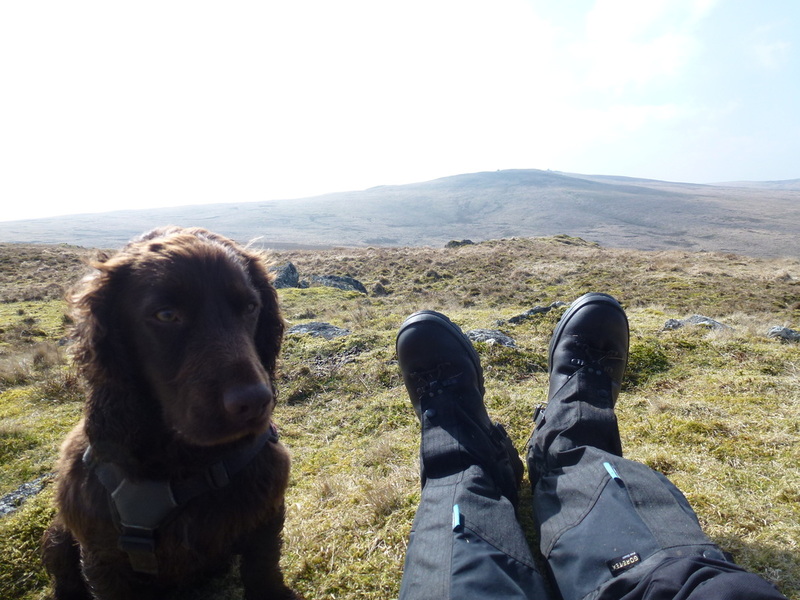 The view from the summit was excellent and with the wind having dropped it was time for Fudge and I to have our lunch and soak it all in. 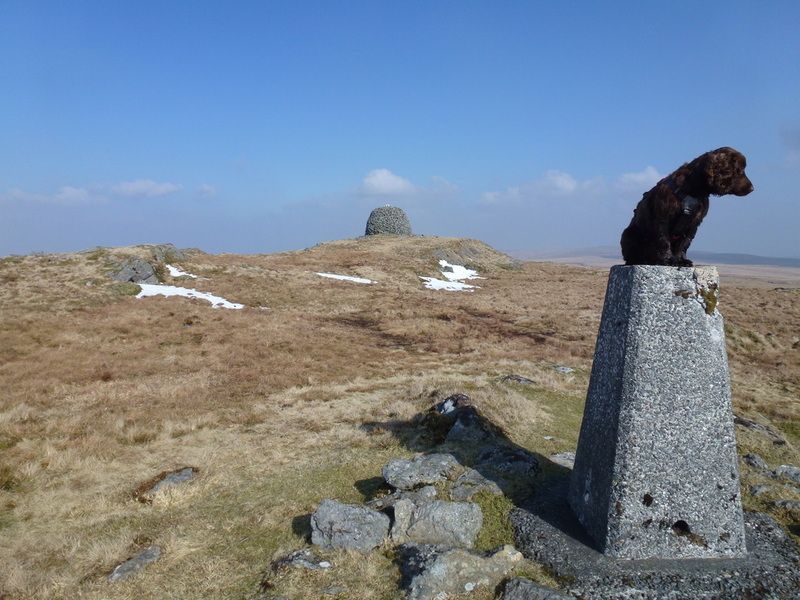 Lunch over, we dropped down to the south to pick up the obvious path to Drygarn Fawr. 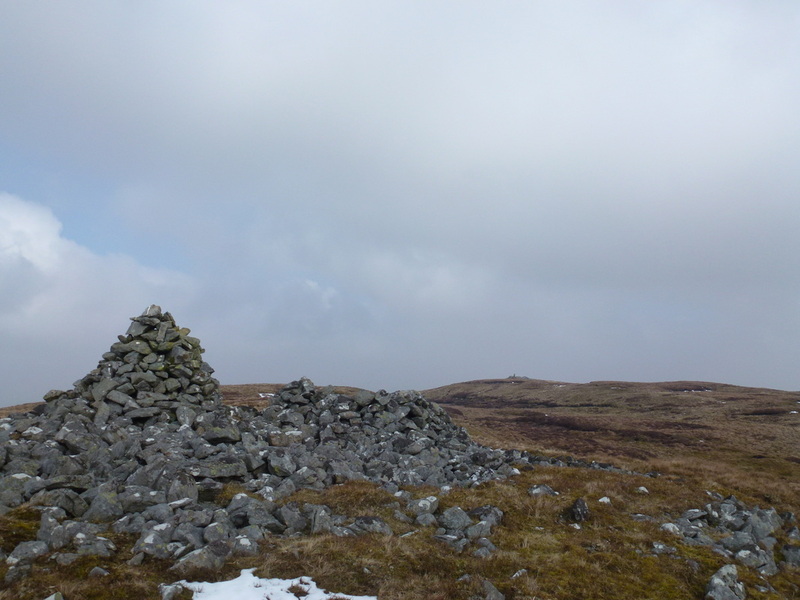 This headed up on a good incline to the first of the two large Cairns, the latter western cairn being the higher of the two. 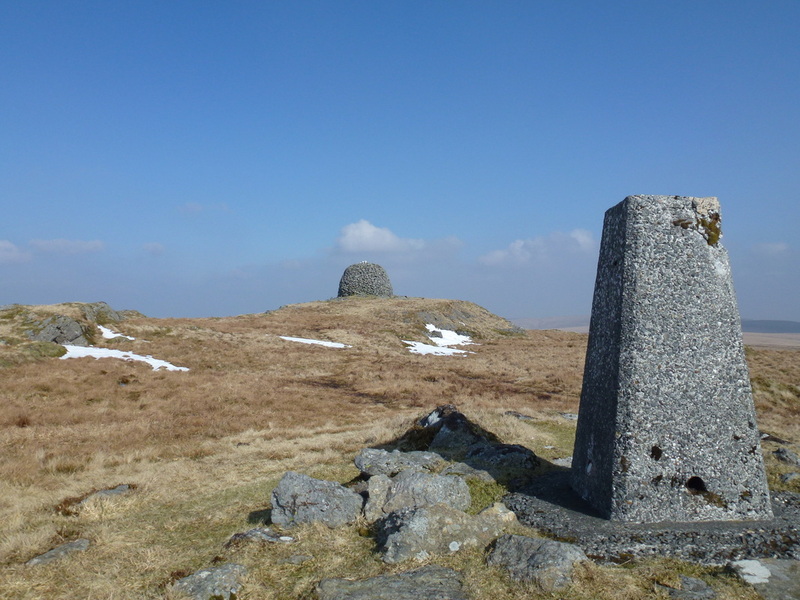 This is deemed the highest point on the mountain but there is also a Trig Point a few yards to the west. 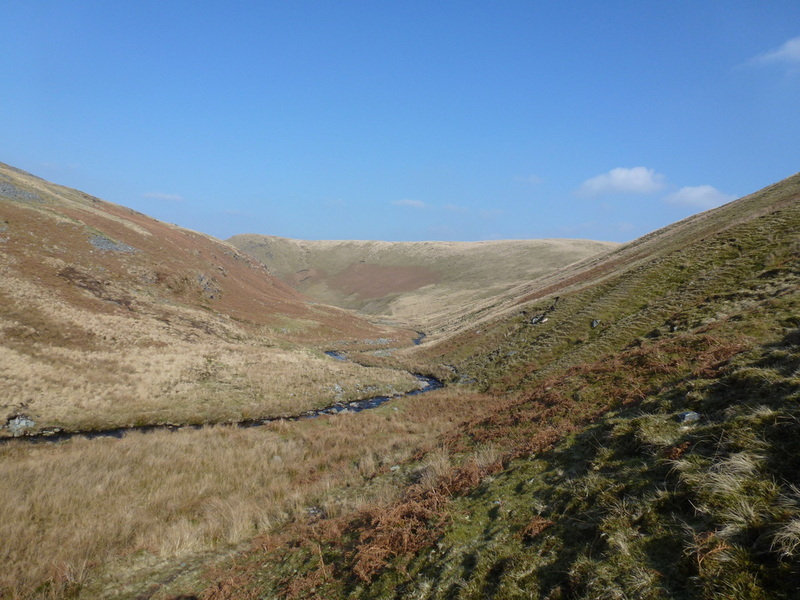 Resuming my route, there was no obvious path down therefore I headed on a bearing over tussocky grass to reach the Nant yr Ast from where I followed the stream north to reach the Rhiwnant. There was now a lovely valley floor walk hand railing the Rhiwnant all the way back to the start, although I intentionally detoured slightly near the end. I really enjoyed this walk. 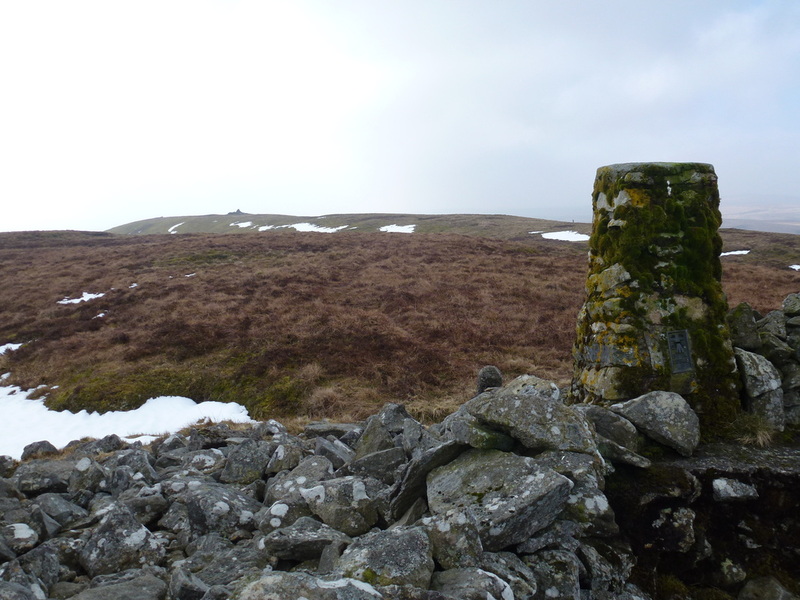 Sure it was a bit featureless and occasionally boggy but it had attractions for me - solitude plus 4 different but lovely summits. I saw absolutely nobody today and I had good weather and visibility too. 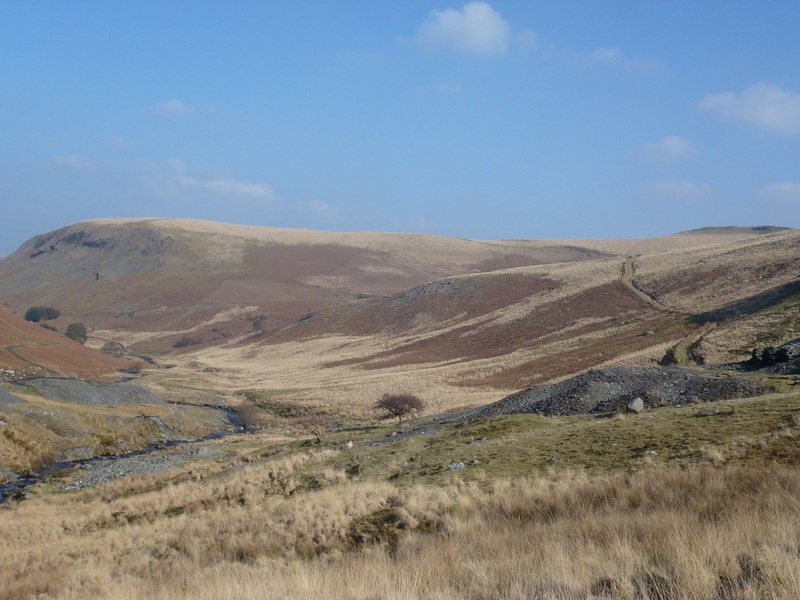 The hills and mountains above the reservoirs of the Elan Valley are unspoilt and long may it continue - if you have not walked in the Elan Valley then you are missing out. The visibility was poor at the moment but would improve. Am I keeping you up Fudge? 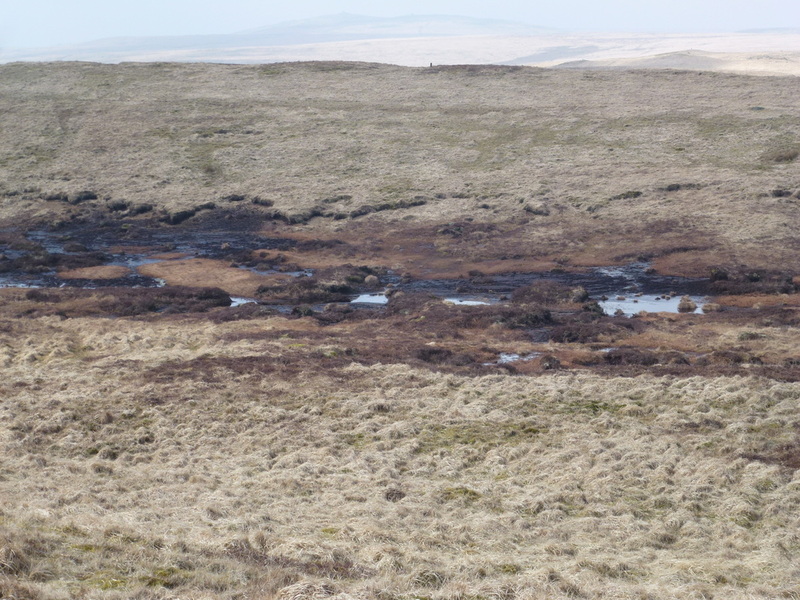 This is the peat bog on the approach and return from Gorllwyn. Easy to avoid, in this case to the right. 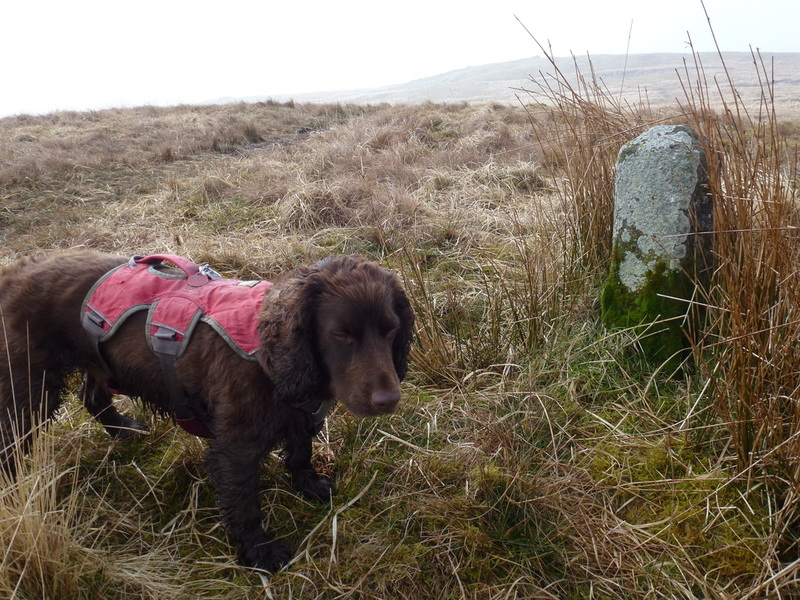 I was heading for the boundary stone ahead. 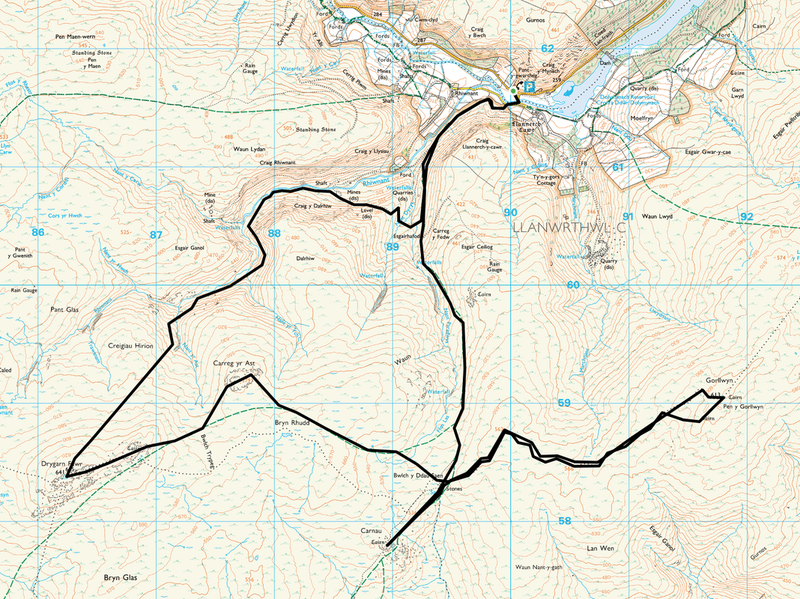 The route back to the start runs to the west of Carreg yr Ast. 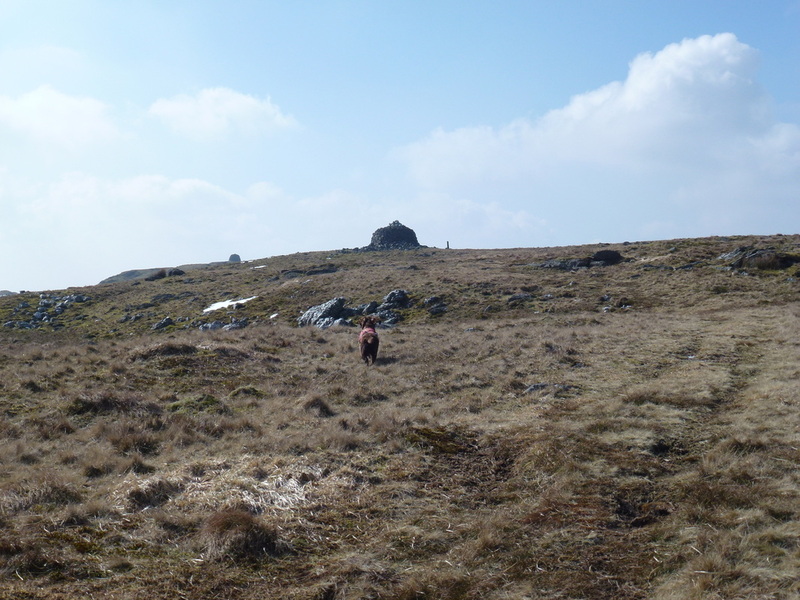 Until I arrived at the stream, the descent was over tussocky and sometimes boggy terrain. Once the stream is met, it is a simple case of following this until joining up with the Rhiwnant (seen here). This leads back to the start point. 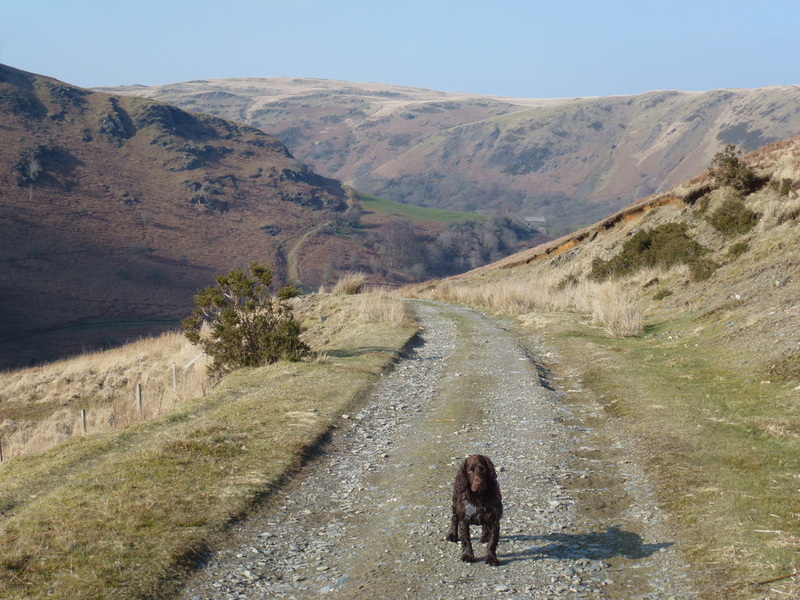 The track brought me back on to the path I took on the outward route - Fudge is wondering where his tea is.